A customer focused e-commerce site design is ideal to kick-start sales and maximize profits. The design is a key component in providing immersive virtual experience to visitors and influencing their buying decision. From exceptional product thumbnails to flexible look and feel, every minute detail of your website is important for engaging the customers. Creating high-quality e-commerce website designs in-house can add up to your overhead costs without adding any value. So, the best option is to outsource e-commerce website design to an outsourcing firm. Outsource2india is one of the leading e-commerce design company offering global clients with solutions to simplify and streamline the management of their online business. A professional e-commerce design is the key to carving opportunities that leads to successful sales. We specialize in providing customized website designs that help you to promote your brand voice and stand apart from the rest. Today, approximately 40% of the website visits come from mobile devices. Therefore, if your site is not mobile-ready, then you might be losing out on huge profits. At Outsource2india, we also have the expertise to provide tablet and mobile-friendly website designs. The best way to align online retail architecture with today's requirement is to customize e-commerce websites with advanced designs. Our ingenious designs automatically attract the target customers and ensure high user engagement. The type and kind of e-commerce web designs for a specific web portal can differ with the type of business it has. We understand this and our experts will include all the essential details of your business while customizing designs for your e-commerce website. We also design templates for e-commerce websites and strictly concentrate on all the details, which have been specific by our clients. This ensures that the templates designed attract and engage the target audience. We also customize templates to specifically suit the client's business requirements. Our skilled professionals are capable of designing static website designs that better showcase your business online. We provide inexpensive static website designs that are ideal for your business and will also make changes in the design if required. We blend innovation and creativity in the right proportion to create dynamic web designs that precisely cater to your business requirements. Well-designed dynamic e-commerce websites ensure better customer engagement and generate better business leads. 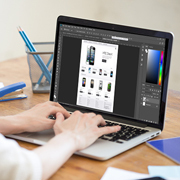 As images speak louder than the words, we create graphic designs for e-commerce websites that clearly define the products and services offered in the best way possible. Our designs focus on presenting the users with clear messaging and strong call-to-action, which push them to take action. Why Should You Outsource e-commerce Design to Us? Outsource2india is an outsourcing company offering comprehensive range of creative design services and ecommerce design services in India to global clients. Being in the industry for over 18 years now, we offer e-commerce designs that help you to stay ahead of your competitors and also strike a chord with your clients. We also provide professional graphic design services, brochure design services, etc. Furthermore, our logical and innovative designs ensure that the final output drives customer engagement, acquires new customers, increases profits, and builds customer loyalty. If you are looking out for top-quality e-commerce designs, then you have come to the right place. Just get in touch with us now to discuss your project needs with our designers.